Salena is a graduate of Northeastern University’s Doctor of Physical Therapy Program, earning her degree in May 2015. Salena attended University of Massachusetts Amherst for her undergraduate years, where she earned her Bachelor of Science in Kinesiology. 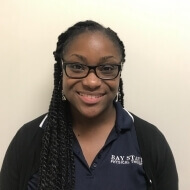 Her clinical experiences include treatments in an adult day care facility with a focus on the geriatric population, as well as treatments in outpatient orthopedic clinics with a large focus on manual therapy, therapeutic exercise, and therapeutic activities to improve patients’ functional abilities and overall quality of life. Although Salena grew up in a small suburban town about 20 miles south of Boston, she finds a huge passion in serving the communities of the Boston area working towards a generalized improvement of the patient population. In her future, Salena plans to begin a mentoring program for the youth at her high school, which she graduated from in 2006, in order to motivate children who are interested in the healthcare field. In her free time, Salena enjoys playing her flute, participating in Caribbean dance and one day, she hopes to follow her mother’s footsteps and hike the tallest mountain on each of the seven continents!